EUREKA – Sissy Jr. hung a 20-point jam on Silicon Valley Roller Girls’ Dot.Kamikazes early in the second bout to ignite the sold-out crowd at Redwood Acres Franceschi Hall Saturday night. With solid play, smart strategy, great pack work and jammers on fire, the Humboldt Roller Derby All Stars avenged earlier losses to the visiting team. At halftime the score was 68-38 with Humboldt in the lead (which, in derby, is by no means a certain game). The Dot.Kamikazes came out and scored some double-digit jams, but HRD answered in kind. Jule Injection had the most hits for Humboldt and Anti Hero the most knockouts (forcing an opponent out of bounds). This bout was a total team effort, displaying the maturity of an experienced, hard-working league. In the evening’s first bout, the Silicon Valley KillaBytes were able to keep the Humboldt fans subdued with a 259-121 victory over Humboldt’s Redwood Rollers. The Rollers kept the fight up throughout the bout but couldn’t answer the KillaBytes’ experience. 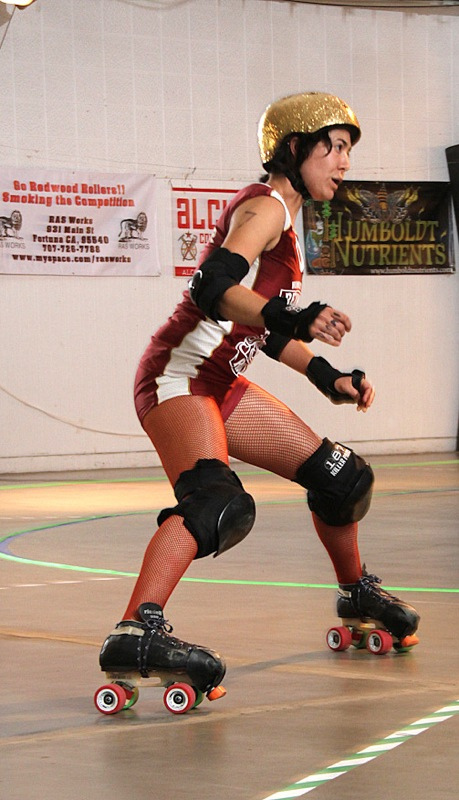 Silicon Valley has a seasoned league of skaters, already certified by WFTDA (Women’s Flat Track Derby Association). Humboldt is currently a WFTDA Apprentice League, working constantly toward certification with the help of teams like Silicon Valley’s. The last bout of the season will be Sept. 11, against the San Diego Derby Dolls, and also will feature the return of the Widow Makers and the North Betty Jettys (teams made up of players from the Humboldt Roller Derby league). The Dirty Derby Blowhards band and the Derby Darlings will be there to help close out the year as well. Tickets are on sale NOW at the Works in Eureka and Arcata, and online at humboldtrollerderby.com. Bouts always sell out, so get your tickets early! This entry was posted on Wednesday, August 25th, 2010 at 4:21 pm	and is filed under News, Community. You can follow any responses to this entry through the RSS 2.0 feed.